The Expat Compass: Second homes, your first choice? Buying a home in a city such as Mumbai can prove to be a herculean task. Imagine you shelling out more money to buy one more home? Wouldn't it give you sleepless nights? We tell you why it's not such a bad idea. The concept of second homes has been gaining immense popularity among Mumbaikars seeking a peaceful abode, away from the noisy city life, to relax and unwind them. "Different people have different reasons for buying a second home. While some may buy one to spend vacations with family, others may simply buy it to reap investment benefits in the future. One may not be able to always travel too far away from one's workplace for a vacation, due to time constraints. In such scenarios, a home close to your workplace or original place of residence turns up well as a probable solution. In case of investors too, it is quite simple to understand their reasons for investing in a second home. While some investors are simply looking for avenues to tie up their money, others are looking for investments, which will fetch them high and steady returns and it is no hidden fact that the real estate sector has been, for the last two decades, the best bet when it comes to good investments," feels Vi jay B Pawar, Founder and Director, Mirador Dwellers Pvt Ltd. Experts believe that Mumbai's real estate segment has witnessed a spree of changes in the last two decades. Mumbai, unfortunately hasn't turned out the way it was envisioned to, when the city was being planned decades ago. Due to this, even though people own homes in the city, they are still on the lookout for second homes for a relaxing getaway away from the hustle and bustle. Anuj Puri, Founder, Anarock Property Consultants points out, "The primary objective for most Mumbaikars is to secure a self-owned home, which is in itself, a massive financial undertaking. 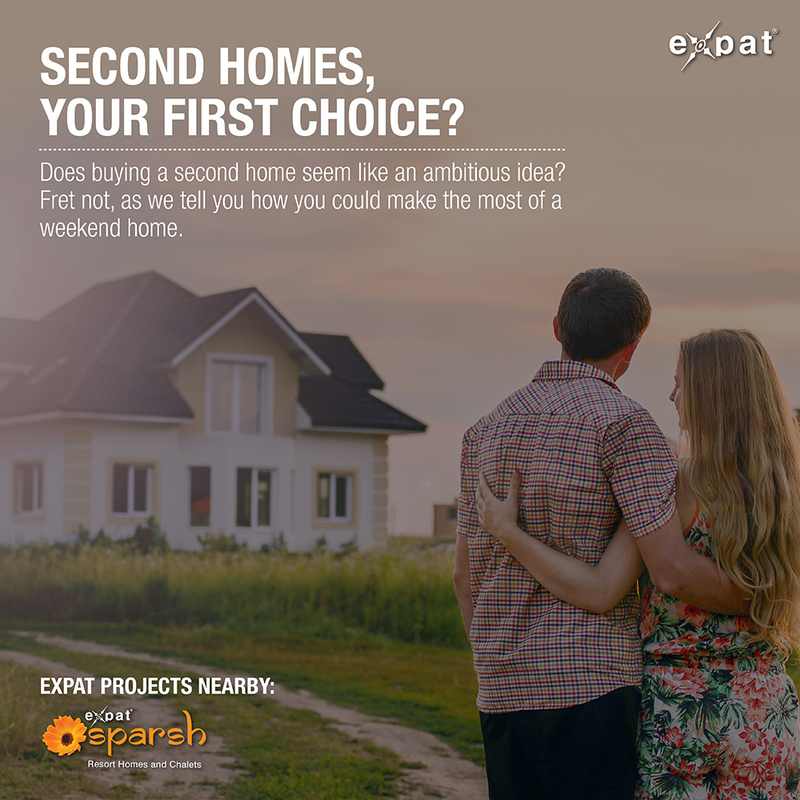 For those fortunate enough to be able to afford a second home after this objective is fulfiled, it can be seen as a major income-generating asset, a source of financial security and if the second home is a weekend getaway, a significant lifestyle enhancement." A family looking for a short vacation or a young couple looking to blow off some steam after a hectic week at work, find their solace within the confines of their second home. There also exist those people who like to see a handsome ROI on every single penny that they invest anywhere and for such people, real estate investment is always seemingly lucrative and inviting. These people have started to move away from investing in open land and are slowly moving towards buying ready-to move-in homes or plots, which allow them to build a second home of their choice and their convenience. "As there is a lack of greenery in cities, buyers opt for Matheran, Mahableshwar as potential second home options. Closer to the city, you also have places such as Lonavala, Murud, Karjat, Dahanu and others, which can act as weekend spots. People who prefer beaches over the mountains have Kashid, Goa as options," suggests Rushabh Vora, co-founder and director, SILA. Experts suggest that for rental income and capital appreciation purposes, areas in Navi Mumbai, Thane and Panvel are suitable. Locations like Kanjur marg and Mulund also work well. For weekend homes, the obvious choices include Lonavala and Khandala, Alibaug, Igatpuri and the greener outskirts of Pune. Goa is also suitable for those who are not averse to long road trips or flying. "In the holiday home segment, we have recognised two types of buyers one that loves the dense greenery of mountains and hills and the other that loves the vast expanses of the riv er and fields. For the mountain and hill lovers, the ideal location could be the Nilgiris and the de sign of the home can be designed keeping the colonial Britain in mind, whereas, for those who are interested in waterfront homes, the design should be adaptable to the given environment and meet the local needs and lifestyle of the residents," opines Nibhrant Shah, founder and CEO, ISPRAVA. The buyer needs to ensure that the location where he wishes to buy a second home is safe and most importantly, a peaceful abode.